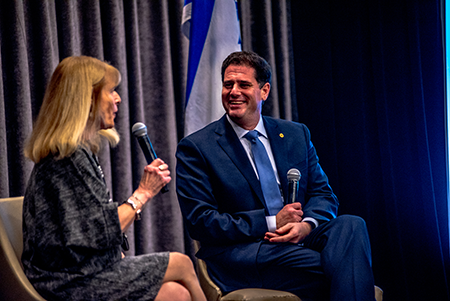 Ron Dermer speaking with Hadassah National President Ellen Hershkin. Photos by Ben Droz. 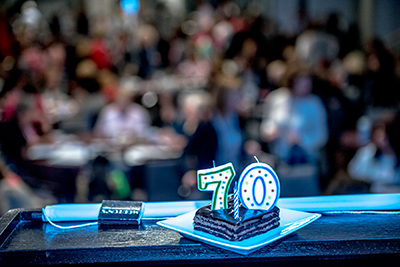 Taken together, these events mark a “historic time in the life of Israel,” Dermer told a rapt audience enjoying the May 17 afternoon session dubbed Chai-Tea. Simply put, Dermer said, Israel viewed the nuclear deal as an existential threat because it would not stop Iran, which calls for Israel’s annihilation, from obtaining nuclear weapons. While the move drew outrage in Europe, Dermer noted that Jerusalem’s endorsement was echoed by Saudi Arabia and other Middle Eastern nations—in other words, he said, by those who live in, and understand, the neighborhood. “I hope that people can support an effort to confront that regime and not appease it,” he said of Iran. As for the long-anticipated relocation of the United States Embassy to Jerusalem, Dermer called it “one of the four great decisions in the history of Zionism,” along with the Balfour Declaration, the United Nations’ recognition of Israel and President Harry S. Truman’s recognition of the Jewish state. “That act of opening the embassy was a small step for peace and a giant leap for truth,” Dermer said. “It punctures the lie that the Jewish people are foreigners in our homeland” and enables the recognition of Jewish ties to Jerusalem. “To recognize that connection is to admit that the Jews are in that land by right, not just by might,” he asserted.